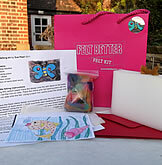 This wet felting kit comes with everything you will need to make your first piece of felt. This kit comes with everything you will need to make your first piece of felt. The kit includes full instructions for felt pictures and felt beads. 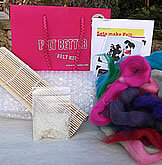 It also contains bubble wrap, a felting mat, a packet of soap flakes to make into a felting solution and a lovely selection of different colours of fine merino wool all packaged up in a pretty pink bag. This is a lovely gift for a special person or even a treat for yourself. A very good introduction to the fascinating craft of felt making.